Lynn Blue pours over graduation data looking for weaknesses. Men are graduating at a lower rate than women, noted Blue, vice provost and dean of academic services and information technology at Grand Valley State University, as is the case across the country. The school enrolls a lot of students whose parents didn’t attend college – “first generation” in university enrollment lingo – and minorities, two groups that traditionally earn degrees at a lower rate. “We’re concerned about the gap,” Blue said. The veteran administrator is so focused on how to improve GVSU on-time graduation rates, she sometimes overlooks how far the school has come. The school has the highest four-year graduation rate among Michigan’s 15 public universities outside the state’s flagship campuses in East Lansing and Ann Arbor. Grand Valley’s numbers follow its innovative decision to cut tuition for students who are on track to graduate. Grand Valley’s graduation rate has doubled since 1990, continuing to rise in recent years when most universities’ rates have stagnated. Twelve of Michigan’s 15 public universities have four-year graduation rates below the national average of 31 percent; at nine public universities, one in five students or fewer earn a four-year degree in four years. If Michigan wants to get more degrees in the hands of more students in less time, college leaders should study what’s happening in Allendale, home of Grand Valley’s main campus. 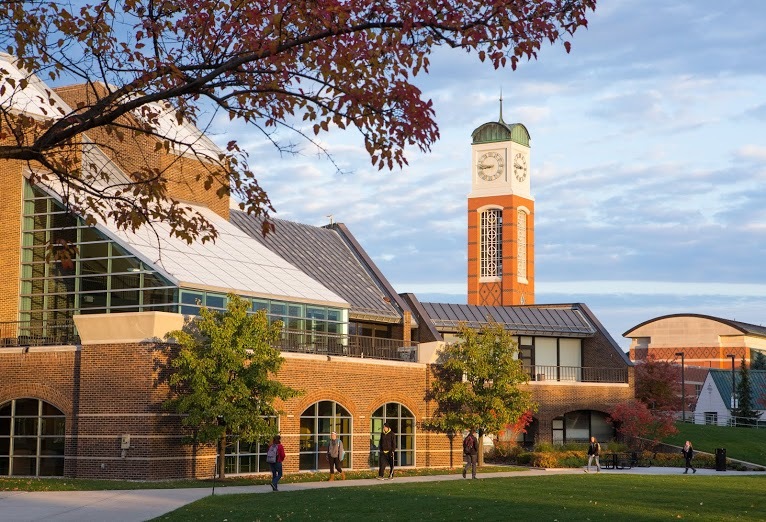 Grand Valley’s four-year graduation rate – the percentage of first-time freshmen entering the university who earn a bachelor’s degree within four years – was 15.8 percent for students entering the school in 1990. For students enrolling in 2000, the rate inched up to 19.4 percent. Fast-forward to the freshman class of 2009, and the four-year graduation rate is 36.7 percent – well above the national average of 31 percent in the most recent national data available. Grand Valley’s students come to the school with ACT scores comparable to incoming students at Central Michigan University. Yet for the freshman class of 2006, the latest year for which data is available at the National Center for Education Statistics, CMU had a four-year graduation rate of 20 percent; GVSU, 31 percent. Grand Valley’s internal data indicates the grad rate has since increased to 36 percent. SEARCHABLE DATABASE: Where can Johnny get his diploma the fastest? Merit scholarships at Grand Valley only last for eight semesters, so a fifth year can cause sticker shock. Low-income students often reach the federal maximum on student loans for bachelor’s degrees in four years, leaving them to take out private loans for a fifth year. Since 2008, Grand Valley has offered a financial incentive to stay on track to graduate on time. Students who’ve accumulated at least 90 credits through their junior year are given $1,000 off tuition for their senior year. With 120 credits needed to graduate in four years, 90 credits in three years is a marker of on-time graduation. “That made a pretty big statement to families that we are interested in (students) getting through in a timely way,” Blue said. Grand Valley students also have access to an online academic career tracker, called myPath, through which students can see from day one what they need to do to graduate. As they complete elements needed for graduation, those elements are automatically checked off. Grand Valley asks students to give their parents access to myPath so they can keep tabs on progress also. “It’s insurance against academic misadventure,” Blue said. Bre’Anna Tinsley, 22, of Detroit, used myPath “all the time” to keep tabs on her progress at Grand Valley. “I could see what classes I needed to graduate so I could sign up,” Tinsley said. Her academic advisor seemed as available and helpful as a hotel concierge, answering emails quickly and working long, flexible office hours. Tinsley received a $1,000 tuition credit after completing her junior year on track, and graduated this spring with a bachelor’s degree in journalism. “Graduating in four years may not be for everybody, but it was a good thing for me,” said Tinsley, who now works as an intern at Michigan Radio in Ann Arbor. This report leaves much to be desired in terms of identifying why the rate of four year graduations seems to be going down. I would like to see more info involving student economic status, working status, ability to get decent loans, parent financial assistance rates, remedial classes required, and their relationship to graduation. Is there data related to recessions and graduation rates? How deeply in debt can we expect people to go in an attempt o graduate earlier? I'd be really cautious to take out more loans when I could not even be sure of getting a decent job upon graduation. It also seems that many of the jobs (non-technical) college grads can get upon leaving school start in the $30-40,000 range. They also appear to have diminishing prospects for significant increases over time. Are today's kids simply in less of a hurry to enter the fulltime workforce since they know they will have to work into their late 60's to even consider retirement? Finally, how can we fairly compare colleges and hold them accountable when they obviously have different student bodies? Colleges with more needy students obviously need to provide more supports to get higher graduation rates. How do we deal with that issue with the last several years of declining state support for higher education? Public schools are now incentivized to use best practices, maybe it's time to do the same with our universities. What are the trends and discussions in this area? Aren't student "consumers" purchasing a product at an individually unique pace? The phrase "all things being equal" simply does not fit the paradigm.